With all coveted designers, nasty fakes will follow. Learn some easy Balenciaga authentication tips in this guide that compares an authentic classic city motorcycle bag to a replica. 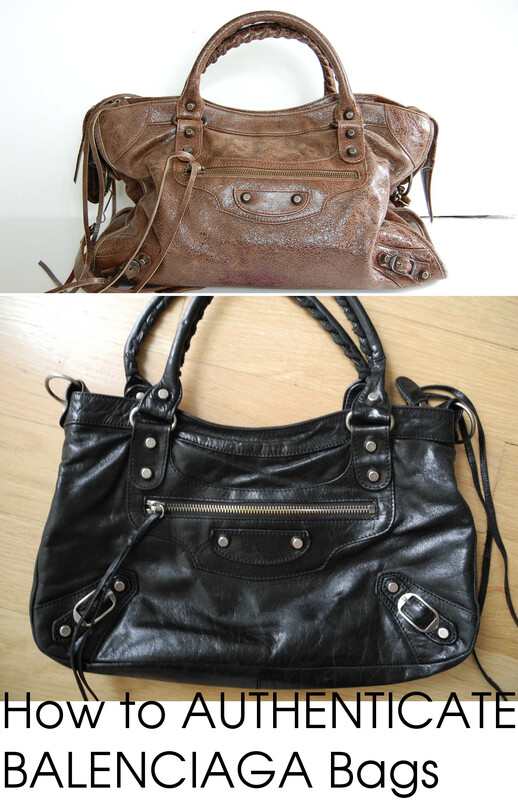 Here is an authentic brown Balenciaga classic city moto bag and a counterfeit Balenciaga classic city bag. The bag number 115748 is depicted on the main label of both bags; 115748 is the style number for the classic city. So, right off the bat, we know that the black bag is fake, because the main label has the bag number for the "classic city," but the bag itself looks more like "the first." 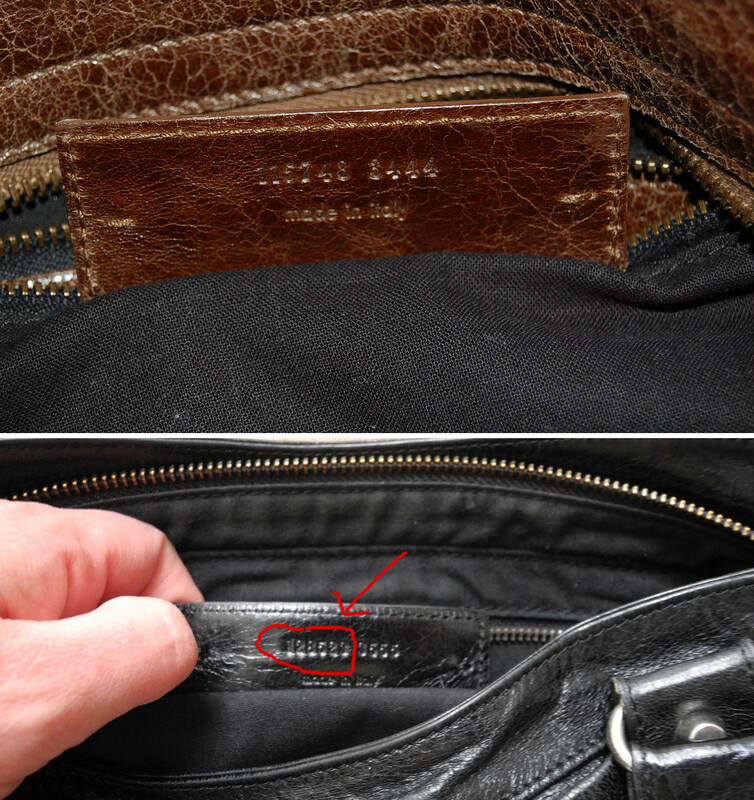 Speaking of the main label, let's take a look at the most obvious and easy authentication tip for this bag. The font is not nearly as crisp on the replica black bag. Balenciaga stamping is always very crisp and clean. Also, notice the top stitching that runs across the top of the leather frame on the authentic brown bag; the stitching is black. When the label is right below the zippered inside pocket, the stitching is usually black no matter the color of the moto bag. The counterfeit also has black stitching which is correct. It's still worth mentioning, because this a common and easy authentication tip. Turning the main label over, you'll find the full bag number or the remaining part number. On the genuine brown bag, the numbers 115748 are reiterated on the back and followed with additional numbers. All is as expected. As if all the errors already displayed aren't enough, let's take a look at the back of the zipper. 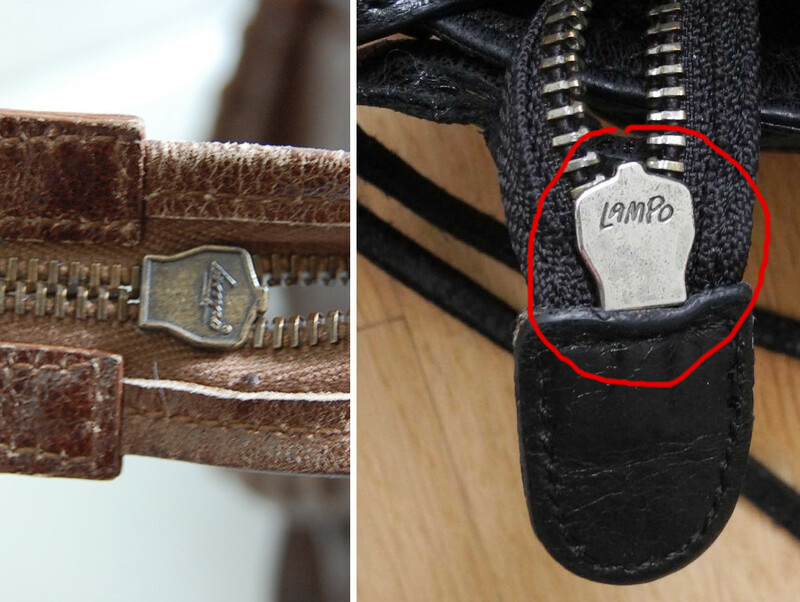 Balenciaga has used a few types of zippers; one of them is Lampo zippers. But, the fake black bag uses a Lampo zipper that Balenciaga NEVER used on their moto bags. The metal rivet at the base of the handles is a common inspection point for Balenciaga lovers in the resale market, because Balenciaga has only used a few types of rivets on their bags. 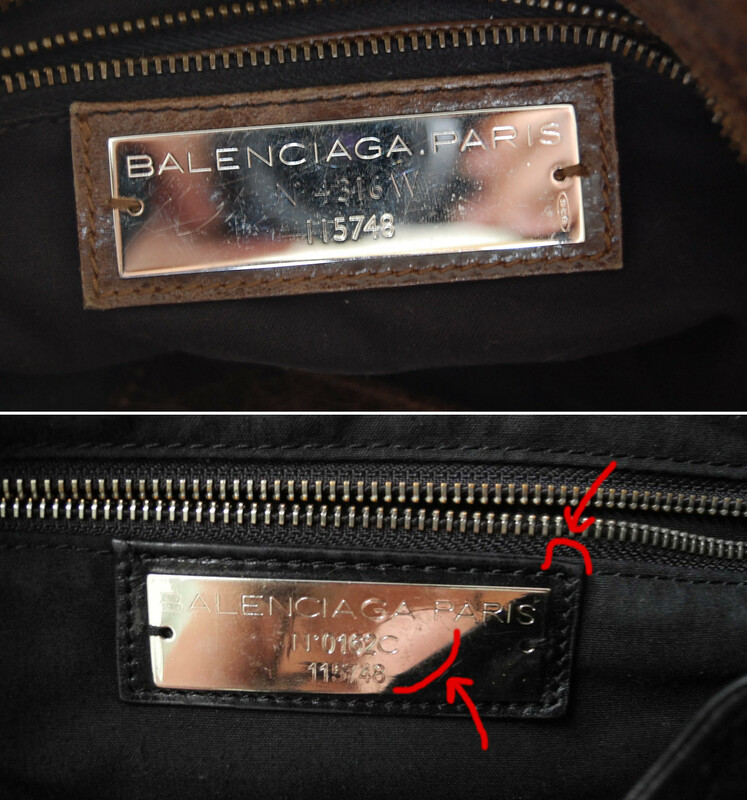 Some older Balenciaga bags used rivets without any notches, so the rivet on the counterfeit black bag is actually not a sign of necessarily being fake. 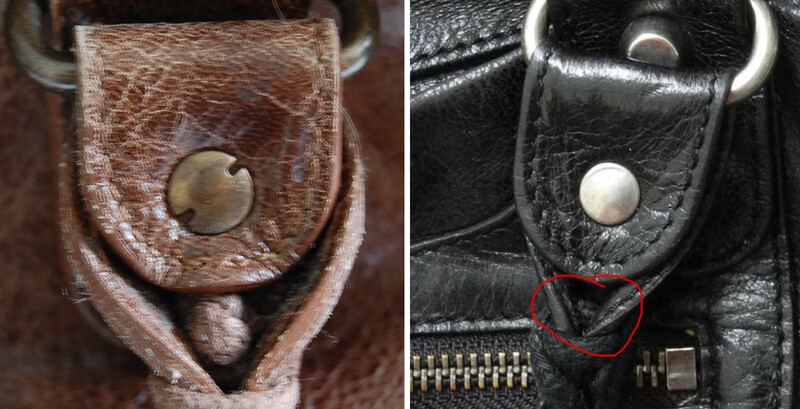 For older bags, there ought to be knot at the ends of the handles. For newer bags, there may not be a knot. Looking at the fake on the right, it sports an older style rivet, but has NO knot; this gives away that it is a fake. Fakes come in different grades. This was just one example. Many counterfeits are much more convincing, and some are worse. Authentication is complex and specific to not only the brand, but the time of production, style of bag, leather type, etc, and many features of the bag need to be observed. If you are shopping resale outside of Lollipuff, please keep this in mind. And, as always, please check out what's available at Lollipuff, the only auction site that pre-screens each and every listing to ensure that no fakes ever end up on our site! For another article relating to Balenciaga bags, find out how to determine the year of a Balenciaga bag. If designer authentication is fascinating, find a ton of designer authentication guides, quizzes and more here! If you need to verify a Balenciaga bag, you may also be interested in our authenticity service.